The Rattlesnake Museum is an exciting and educational experience for the entire family. This animal conservation museum reveals the hundreds of ways that rattlesnakes and other "less desirable" animals have influenced our lives. 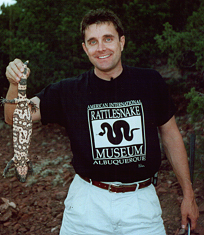 Examples are given through artifacts, memorabilia, and the largest collection of different species of live rattlesnakes in the world. In fact, the Rattlesnake Museum hosts more different species than the Bronx Zoo, the Philadelphia Zoo, the National Zoo, the Denver Zoo, the San Francisco Zoo, and the San Diego Zoo, all combined! Species from North, Central, and South America are presented in beautifully recreated habitats. Myths are explored, phobias cured, and mysteries revealed at this must-see Museum of the Southwest. It's a wonderful way for your family to share in this fascinating, mysterious, and misunderstood corner of the animal kingdom. See you soon! 5 times as many adults as kids visit the museum. The most common comment heard at the museum: "I had no idea there were so many kinds of rattlesnakes!" The Museum is home to 34 different varieties of rattlesnakes.